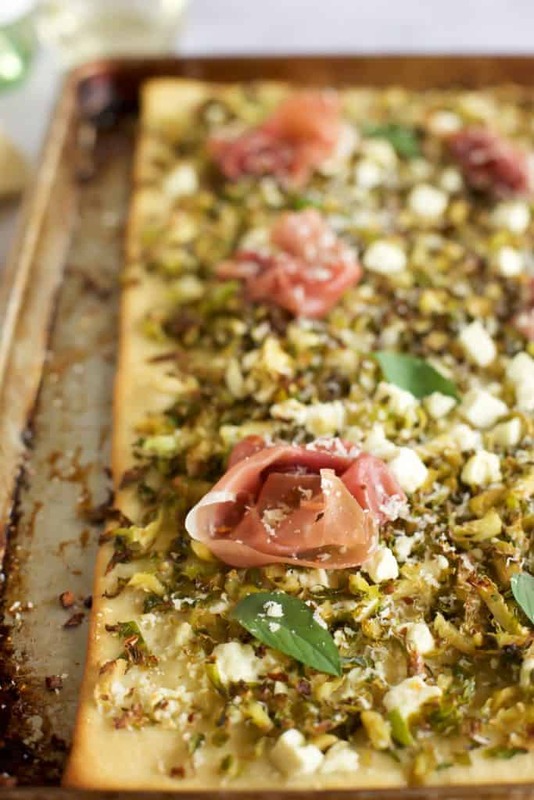 This Brussel Sprout and Prosciutto Pizza screams fall! The roasted brussel sprouts are imparted with a lovely roasted flavor while the prosciutto and feta add a salty punch. This pizza is perfect for all your Fall entertaining goals, especially when paired with Geyser Peak Wine. Don’t you just love entertaining in the fall? With the bounty of fall produce and cooler weather, it’s hard to resist. 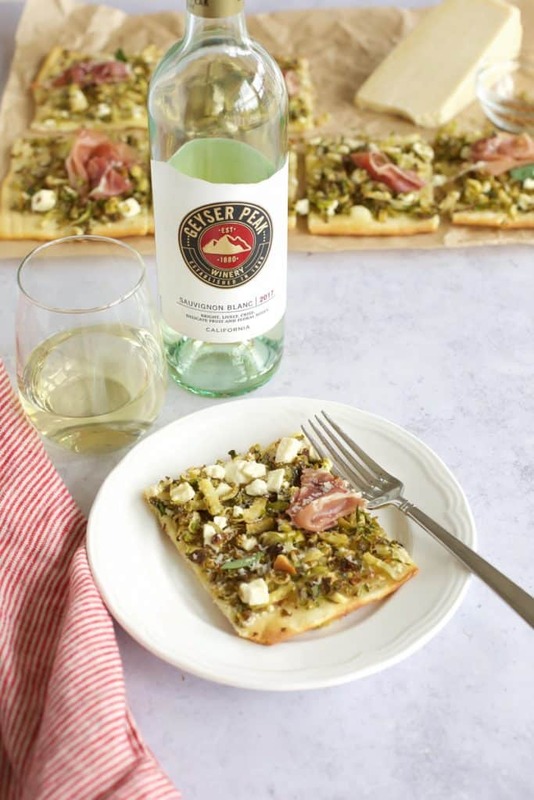 This Brussel Sprout and Prosciutto Pizza paired with Geyser Peak Wines is the perfect, go to combination for fall parties on the patio or by the fire pit! This post is sponsored by Geyser Peak Wines but all opinions are my own. This pizza is easily made with a prepared pizza crust because sometimes you just gotta cheat. I like to use the ones in the refrigerated section that you have to let rise for an hour or two on the counter. If you are feeling motivated by all means, make your own dough… but this is all about EASY entertaining. Pizza is perfect for entertaining because they can easily be made special by adding seasonal ingredients. Just imagine all the fall possibilities: roasted acorn squash, butternut squash, arugula, broccoli rabe, fennel or even figs. I topped this one with a light lemony vinaigrette before adding the toppings. It is simply made with olive oil, fresh lemon juice, salt and pepper. It gives it a nice, fresh taste without the overpowering flavor of tomato sauce. When I eat fresh and seasonally I love pairing my food with a light, crisp Sauvignon Blanc like this one from Geyser Peak. This wine from Sonoma County is a go-to for easy entertaining. I love their entire wine portfolio and pick it up often to have on hand for spur of the moment entertaining. Geyser Peak wines are food friendly and approachable which makes them perfect for entertaining. Geyser Peak has a strong history and connection to Sonoma County and they even have a tasting room in the heart of Healdsburg. They source many small parcels of top quality fruit and they optimize each and every one. Then they combine grape varieties to get balance, harmony and complexity to create one final finished wine. 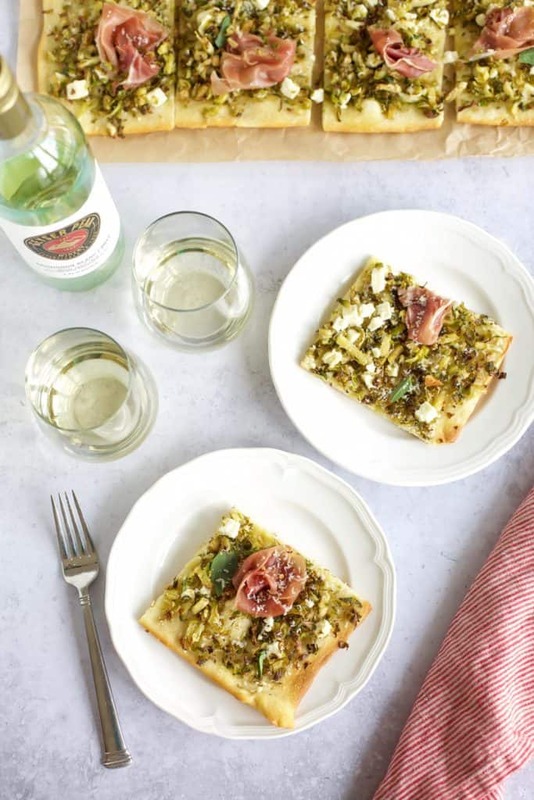 I promise your guests will love this Sauvignon Blanc and this Brussel Sprout and Prosciutto Pizza. Add a salad and sit by the fire for the perfect fall night. 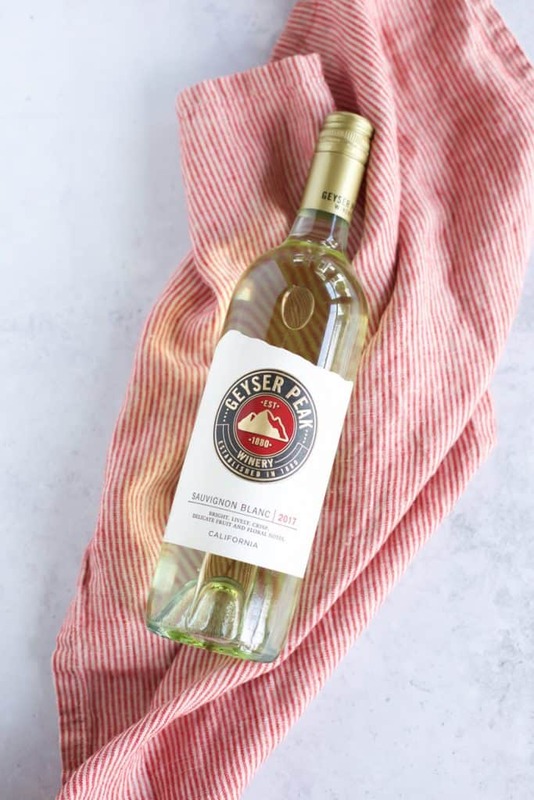 Geyser Peak Winery is hosting a Giveaway! Get into the fall spirit with a stunning wine picnic set complete with delicious local foods that you can take on your autumn picnic adventure. Check it out here and enter ASAP. 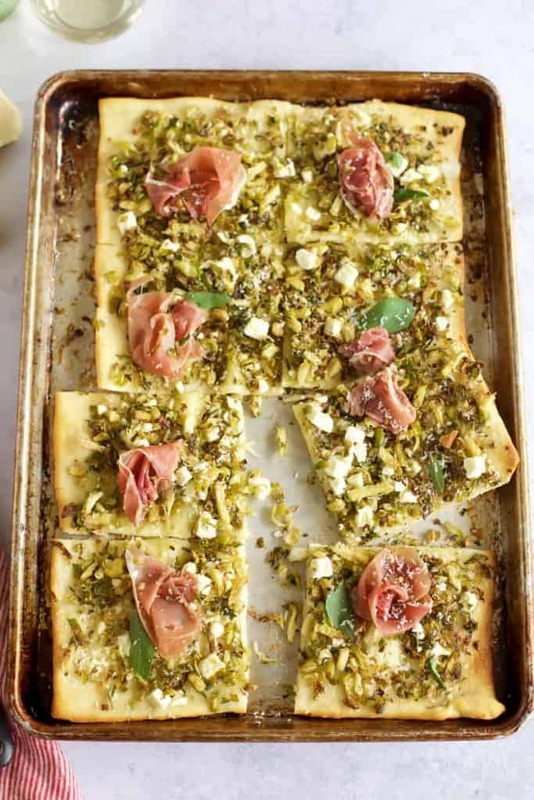 This Brussel Sprout and Prosciutto Pizza screams fall! The roasted brussel sprouts are imparted with a lovely roasted flavor while the prosciutto and feta add a salty punch. This pizza is perfect for all your Fall entertaining goals, especially when paired with Geyser Peak wine! Preheat oven to 425 degrees. Place shaved brussel sprouts on a sheet pan and drizzle with olive oil, salt and pepper. Bake for about 10 minutes or until they begin to brown. Toss once in the middle of cooking time. Spray a sheet pan with cooking spray. Roll dough out and place on sheet pan. Whisk together olive oil, lemon and salt and pepper. Spoon onto dough. Remove brussel sprouts from oven and put onto pizza. Top with feta cheese, parmesan and red pepper flakes. Bake for about 15 minutes or until crust starts to brown. Remove pizza from oven and top with pieces of prosciutto. Serve immediately. Drizzle with balsamic glaze for extra flavor. Check out my Arugula and Prosciutto Pizza too! I LOVE pizza, it is my favorite foot above all and I never have yet thought to put brussel sprouts on. Love the idea and will give it a try. What an elegant looking pizza. I love the combination of Brussel Sprouts and Prosciutto. Looks delicious. I can’t think of anything better than pizza and wine! 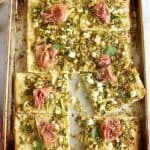 This brussel sprout and prosciutto pizza looks amazing and I can’t wait to give this a try. The pizza looks amazing and I am a Geyser Peak fan too.